Right handed carriage return is odd but I found one gets used to it quickly. The paper tray looks like newer models, but the serial number says this is a 2. Perhaps it was rebuilt or repainted at some point? I forgot to add that you can now visit this blog by simply going to totallyyourtype.com thanks to my old roommate who gave me a domain name as a birthday gift. 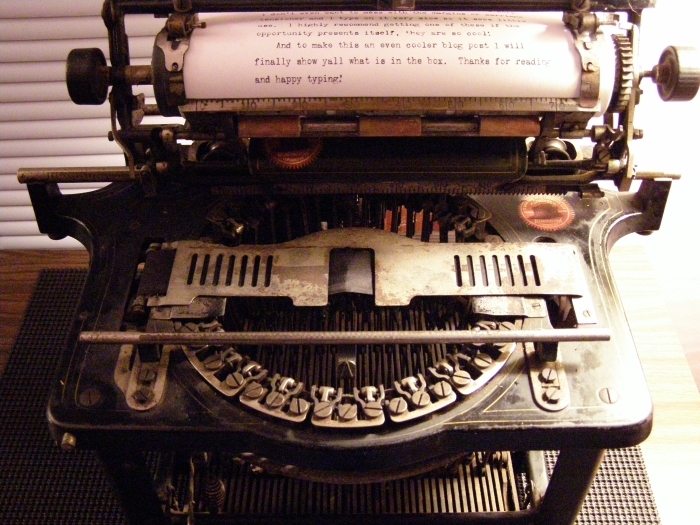 One has to lift up the carriage to see what has been written, the typebars swing up from underneath. Look at how fat that ribbon is! I think the understriking Remingtons look like pouncing spiders with their carriages up. Inside the box, know what it is yet? How about now? It is apparently a 1927 (I haven't verified that yet) 16mm movie projector. It seems to work. I am waiting on an extra empty spool from eBay and then I should be able to watch this short Abbott and Costello skit I have. 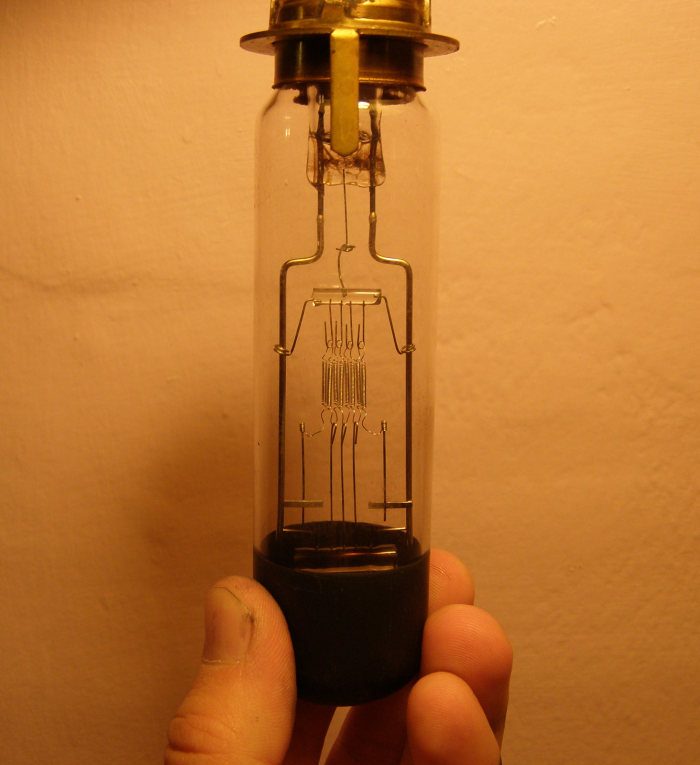 Let's all just hope the day I need to replace this bulb is a loooong ways away... (that's typewriter thumb there, as in ink, I am actually a clean person). A 16mm projector! Love it! What a great looking device. That globe looks in excellent working condition, but they were usually rated to work X number of hours. The Remington types nicely even though it's delicate. I agree that the LC Smith was probably refurbished and got a new decal. Finally, your type-in sounds like a blast. It was a lot of fun, and we plan to make it a tradition. I am glad to see someone lead off a typecast with an old L.C. Smith & Bros. standard machine. 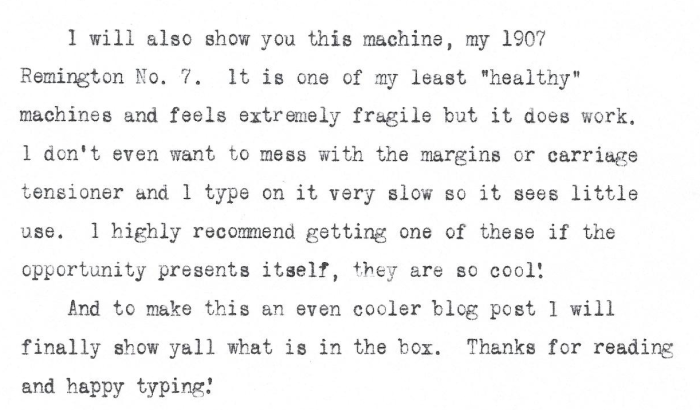 I myself think they're a bit underrated in the world of actual typists today. They do have some quirks, but they're machines you can often find operable and they're numerous enough that you can find one with good decals (original or rebuilt!) if you are patient. Nice reviews - I liked this article very much. Thank you for your kind words! It's true there ought to be more of these old LCs out there; they are so well made and simple and seem hard to break. That's a nice typeface on the old-timer. I'd like to try an upstrike someday. There's a real charm to these older machines, isn't there! I can't wait to get my paws on a Remington 7 myself. What is the name of the projector? I've also got an 8 and 16mm projector, and a bunch of early Disney, and other cartoons. I've also got both 8 and 16 mm cameras from the 20's and 50's. You can still get movie film online, and still photography film, too. 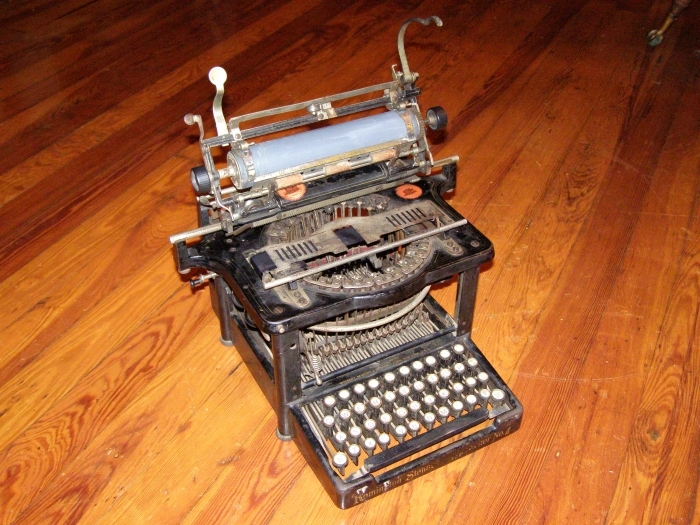 I'm tempted to get some, and do cool photos of typewriters in period settings. It's cool that you're a writer. 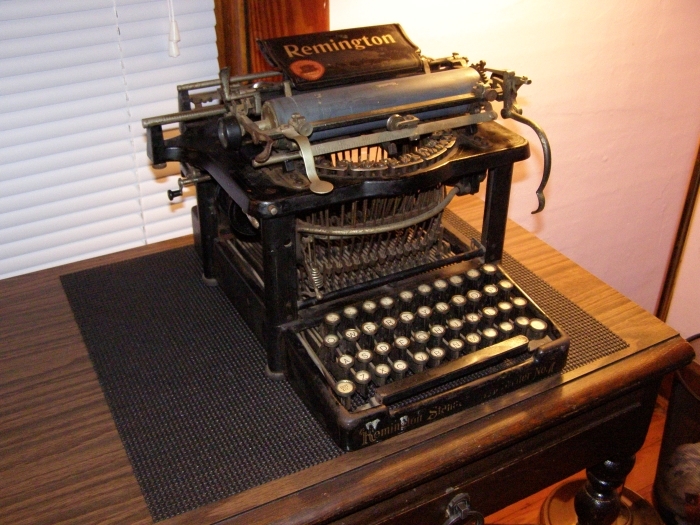 I'm just getting started, but my new/old Woodstock #5 typewriter with all blank keys, inspired me to make up a short story about it's life and history. 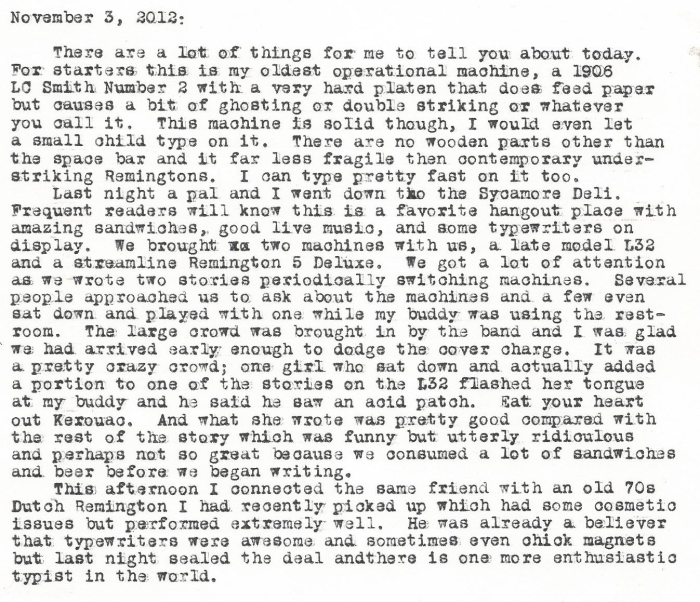 Maybe a few of us should put together a collection of stories about our favorite typewriters lives - Ah what some of them could tell!! Later!! It is made by the Bell and Howell company. Bell & Howell is from Chicago, I used to drive by their offices, but it's now a high rise apartment building - Oh well! 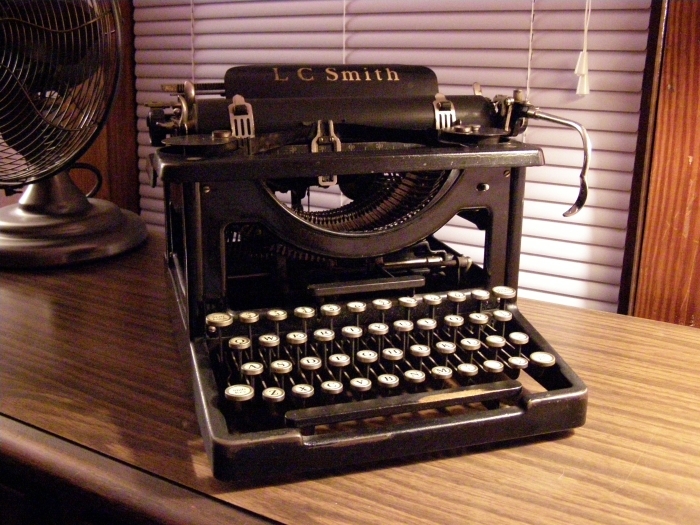 A Post That Isn't About Typewriters?! ?